Food Costs > How Much Does Escargot Cost? How Much Does Escargot Cost? Escargot, often considered a delicacy by most, means edible snail is usually only served at higher end restaurants. Common in French cuisine as an appetizer, you will commonly find this dish on most French menus and seafood menus as well. Escargots are land snails that are cooked as a dish somewhat like a very small version of shellfish. The most well-known species of escargot in France is the Helix. The cost of escargot will depend on how it’s purchased (fresh, canned, frozen), where it’s purchased, the market conditions and where you live. Roland and Helix escargot, a popular variety found at a local grocery store, will cost close to $0.50 to $2 per ounce. On Amazon.com, for example, a popular seller sells a pack of 12 7.75-ounce Roland escargot snails for about $60 or $0.61 per ounce. As for escargot caviar, the costs can be $3 to $5 per gram. Beverly Hills Caviar, an online retailer that sells escargot caviar, sells 30 grams of Imperial escargot caviar for $100. Canned escargot, which is often sold by the dozen precooked, can retail for $3 to $5 per 7.75-ounce can. Walmart, for instance, sells a 7.75-ounce can of Roland escargots for $5, whereas a 7.75-ounce of giant Roland escargot snails retail for $10. Another option, a 28-ounce can of Consul escargot snails retails for $15. In this StarChefs.com article, the cost of canned snail can be $12.85 for 30 to 40 snails, $24 per pound, with shipping, if purchased frozen or $33 per pound if purchased fresh. Fresh snails, while they are very hard to find in the United States, can cost about $1 to $2 per snail. If purchasing in a restaurant, most appetizer dishes will include six to 12 pieces, and the price will be highly dependent upon the restaurant and where you live. The prices, on average, can be wide, ranging from $12 to more than $50 at a higher-end French restaurant. Most escargot sold either comes in packs, with or without the shell, or in a can. They usually vary in size, but there are packs that contain uniformly sized escargot. Escargot is very high in protein and is around 80 percent water. Escargot can be purchased from farms online, Amazon or even locally at your grocery stores in the frozen food or canned food section. Shipping charges may often apply when purchased online due to the sensitivity of the shipment. Plan on adding another $20 to $30 to your order for overnight shipping. 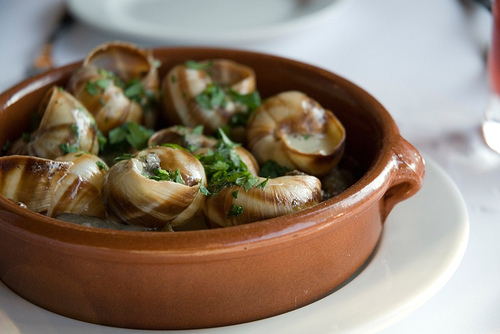 Like most dishes, escargot often goes great with other ingredients such as garlic and butter. As a luxurious appetizer, it can also go great with jello, tuna de tarter, cucumber soap shots and bitter chocolate toasts. Of course, these costs are optional but highly recommended for those who work with them while cooking. Tools, again, while optional are recommended. A pair of specialized tongs, for example, can hold the snail, while a two-pronged fork is used to remove the meat. There are also plates with indentations to hold each escargot in place. All of these tools will cost less than $10 to $15. During the cooking process, the snails are typically purged and removed from the sauce. They are often mixed with either a garlic butter or wine. After they have been cooked, they are placed back in the shell and are served with spices. Most trays at a restaurant will include six to 12 pieces. Escargot in a can typically has a shelf life of two to four months and must be refrigerated. Imper caviar has to be eaten within a week once the can is opened. What does escargot taste like? In most cases, if consumed at a local restaurant, it will have a lot of butter on it, creating a buttery-like taste, but as for taste and texture, it will be very similar to clams or oysters with more flavor. In essence, picture a clam/oyster taste and mix it with a lot of butter and garlic. For those who have never had oysters or clams before, then it’s best to prepare for a rubbery-scallop-esque texture with, again, a very buttery flavor. Consider purchasing escargot snails that are packed and uncooked. You may cook them yourself with any recipe you want and are also going to be cheaper this way. However, if you are not into cooking and/or you’re a busy person, then you may want to consider buying a can or a pack of cooked escargots to include in your favorite ready-made recipe. While it may be a pinch more, they can be prepped relatively fast and are much more convenient. Paid $65/ounce the other day at a local fish market.